Sailing away from our port of embarkation, I join my fellow cruisers on deck to wave goodbye to Barcelona. As we gracefully float by a Disney ship docked at the next berth, its passengers wave happily to us. Insinuating that we're envious of not being on a Magic Kingdom cruise ourselves, that ship's thunderous horn gloats to the tune of "When You Wish Upon a Star." 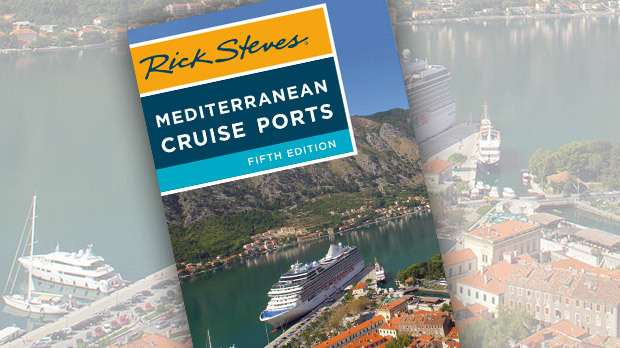 This is my first Mediterranean cruise, so my learning curve is steep. I'm sailing with Royal Caribbean on the good ship Liberty of the Seas. We've got 3,700 passengers and a crew of 2,000 on board, and already I can feel some "ship pride" setting in. With its flair for splashy design, the ship is a cross between Disneyland and Las Vegas. 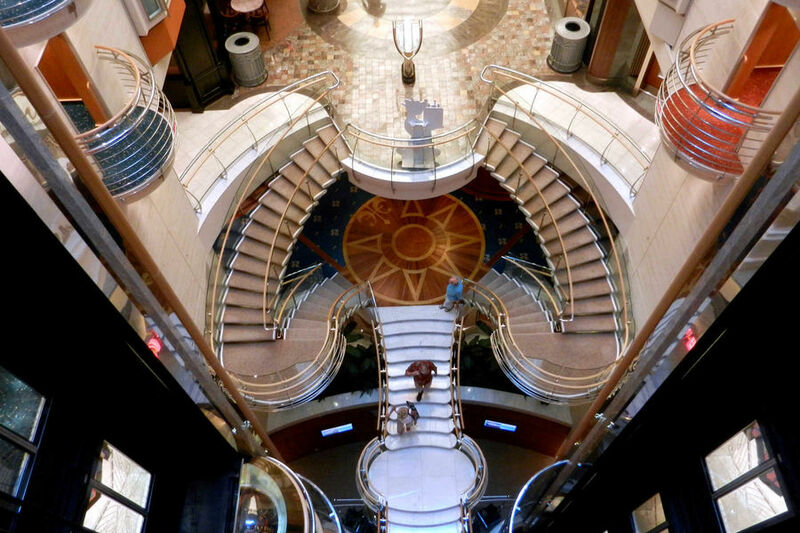 I can't stop marveling at the wild, womb-like lines of the staircase in the "main street" core of the ship. Sailing away was quite efficient. While there were literally thousands of people checking in, I got through the line quickly because I carried on my own bags, and the ship offered a big range of check-in times to thin out the congestion. Every cruise starts with three crucial steps: dropping off your bags, checking in, and "embarkation" (the security checkpoint and actually boarding the ship). If I had checked my bags, I would have been delayed, and then had time on board to kill while waiting for my bags to get to my cabin. Make a point to thoroughly move in — and use every square inch of storage room in your tight cabin. I've never packed so much before: deck duds, nicer evening wear, and rugged travel clothing to use on land. I even brought four pairs of shoes...if you count my flip-flops. Everything had a place in my ship-shape cabin. First-time cruisers can obsess about clothes — especially what to wear for the "formal nights." While most cruises do have a few formal nights with a dress code, they're not as stuffy as you might think. And these nights are optional — you can always eat somewhere other than the formal dining room. My advice is to dress up only as much as you want to (but keep in mind that if you plan to eat every meal in the dining room, you must adhere to its dress code — most cruise lines forbid shorts or jeans at dinnertime). When choosing clothes for days in port, keep a couple of factors in mind: First, the Mediterranean can be very hot in the summer, so it's smart to bring breathable, light-colored clothes and a hat. Also, some European churches (particularly in Italy) enforce a strict "no shorts or bare shoulders" dress code. Pants with zip-off/zip-on legs can be handy in these situations. Some travelers worry about sticking out and "looking American." But no matter how carefully you dress, your clothes probably will mark you as an American. Frankly, so what? I fit in and am culturally sensitive by watching my manners, not the cut of my clothes. Ultimately — as long as you don't wear something that's outrageous or offensive — it's important to dress in a way that makes you comfortable. After unpacking, I sorted through the mix of papers that I'd picked up: special offers, schedules, events, and educational opportunities. One flyer asked, "Thinking about Botox?" Another pitched a "free teeth-whitening consultation." First-time cruisers think they've paid for an "all-inclusive" trip, but are often surprised by how many add-ons they're offered. The basic ticket may be a bargain, but the cruise industry is adept at enticing you with extras that add up quickly. These include shore excursions, casino games, premium drinks, specialty restaurant surcharges, duty-free shopping, fitness classes, spa treatments, photos, and many other goods and services. It's very easy to get carried away — a round of drinks here, a night of blackjack there, a scuba dive, or an ancient-ruins tour. First-timers — even those who think they're keeping a close eye on their bottom line — can be astonished when they get their final onboard bill, which can easily exceed the original cost of the trip (or so hope the cruise lines). If you're new to cruising, keep your splurges under control. By the time I'm done unpacking, we're far out on the glistening water, so I go up to the main deck. A great thing about cruising is that you really notice the sunset (and, if you happen to be up that early, the sunrise). 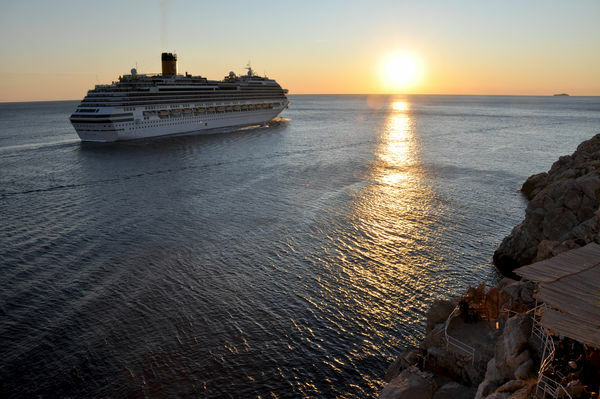 While standing on the top deck of our ship, what impressed me that first evening was that, of the 5,000 people (tourists and crew) packing that ship, I was all alone under a big twilight sky surveying a vast and lonely Mediterranean seascape.